Our love affair with turkeys started more than 30 years ago. 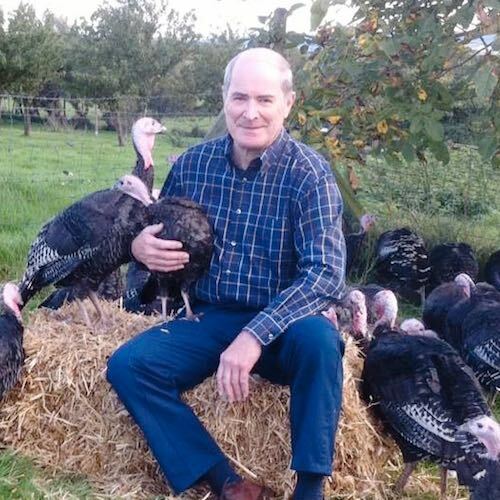 We’d agreed to help a local farmer with his turkeys in the run-up to Christmas. Much to our surprise, we immediately fell in love with these wonderful birds. Before long we’d bought a smallholding of our own and began to pursue our dream and raise turkeys the traditional way. This means our birds are free-range and have an all-natural diet with no additives, antibiotics or animal protein. We give them the happy and healthy life they need to create the most delicious, tender and succulent turkey for you to enjoy at Christmas. Hart’s Traditional Turkeys is very much a family affair. Our children – and hopefully one day our grandson – are involved in the business. We farm no other livestock so can devote all our energies to the birds. We work hard all year round to produce the finest quality turkeys so you can enjoy a Christmas meal to remember. We’ve amassed a wealth of knowledge and experience over the years. We can say with confidence we’re traditional turkey specialists. We’re also committed to giving our customers unrivalled customer service. Christmas is a special time of year and your turkey is the centrepiece of your celebrations. We hope the buying, unpacking and cooking of your Christmas turkey will become one of your favourite festive traditions.